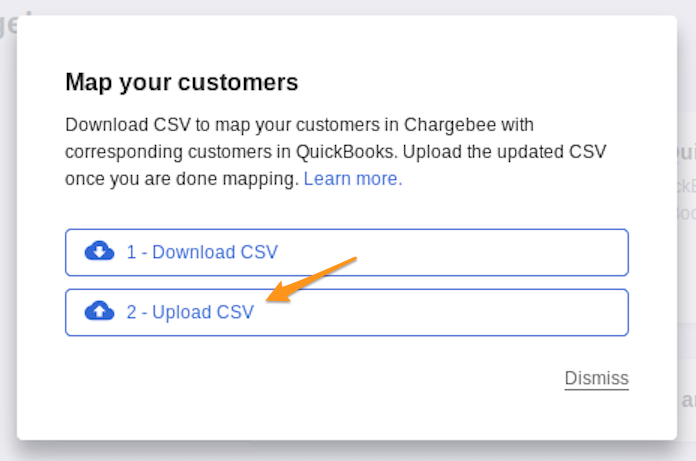 If you would like to start using Chargebee with QuickBooks Online, or have been using QuickBooks Online and have invoices present, it might be a good idea to migrate the customers to Chargebee and map them to avoid duplicates during invoice sync. This document will walk you through the process of migrating and mapping the customer records. If you are connecting a brand new Chargebee site or an existing Chargebee site, to your QuickBooks Company which has customers and invoices already created, you can migrate the customers into Chargebee. For information on how to migrate your customers to Chargebee, check our migration documentation. If you have manually imported invoices into QuickBooks from Chargebee, the customers present in Chargebee would have been created in QuickBooks. So, once you start the sync, there is a probability of creating duplicates. The customer mapping process can be initiated after connecting your QuickBooks company to Chargebee. Chargebee will ask you to map customer records if it finds customers in QuickBooks. You can review the details of the customers in the mapping file and view customers which match or not. If the customers don't match, you can update the mapping in the file. If customer information from QuickBooks matches with more than one customer from Chargebee, decide which Chargebee customer you would like to map with the one in QuickBooks. Once reviewed, you can upload the updated customer mapping file. The customers in QuickBooks and Chargebee as matched in the file, will be mapped in Chargebee. When sync runs, customers already present in QuickBooks will not be created. In case you want to skip the mapping step, you can choose to Ignore and proceed. Later during the sync, if Chargebee finds duplicates, the customers will be created with a suffix, such as, ‘ABC Company_2'. Chargebee will check for duplicates based on Customer display name in QuickBooks.